Ive been trying to put together a reference portable headphone rig for a while now, and this will definitely be an anchor in that system for quite a while. 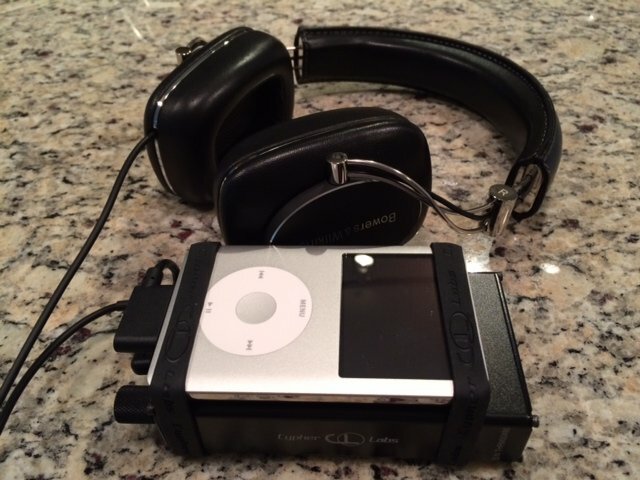 The foundation of my portable rig is an iPod classic, in which Ive replaced the 160GB drive with a 240GB model, while that device has decent sound quality Ive been on the lookout lately for a better DAC and headphone amp and wanted a simple solution for that. Its a portable DAC and headphone amp, and its a damn fine one at that. More specifically, its an iDevice DAC/Amp but also has your standard USB functionality and also has support for Android devices (those that will do audio over USB anyway). I have not tested with Android yet, but as a USB DAC from my Mac it sounds great. Lets not kid ourselves though, the real appeal of this thing is the iDevice support  you plug this thing into the lightning or 30-pin dock on your iDevice (it supports both the old and new connections) and it bypasses the DAC and volume section of your iDevice, and said device basically becomes a user interface and hard drive. There are very few options on the market right now that have this functionality (The Vamp series by VModa, Fostex has one, Sony has one that doesnt sound great, ADL has one that Ive not tried, and CEntrance has the HiFi M8 that I also own and have been comparing against the Theorem). Of the options out on the market, really only the CEntrance is comparable with the Theorem in terms of features and sound quality, more on that in a bit. The Theorem has a single USB input, there are no SPDIF or analog inputs. So if youre looking to use this as a DAC for, say, a CD player youre out of luck. This is a bit of a shame since this device can easily hang in there with very good desktop solutions. Youre also SOL if you want to use this strictly as a headphone amp behind another DAC, as theres no input for it. This is built to be an all-in-one solution and it excels as such, but you give up some flexibility. It has three outputs  a 1/8 headphone out, a RSA balanced headphone out, and a (fixed) line level output so that it can be used as a DAC only in another rig. There is also a three-way gain switch, it powers all my portables fine on the low setting and drives my HE-500 fine on the medium setting. They give you a good set of accessories in the package as well  you get cables for every conceivable connection to the device (30 pin iPod dock, lightning cable, micro USB for Android, and a standard usb for connection to computers). You also get a few different size straps for attaching players to the device, you can see those in the photos Ive attached, and they provide a small leather pad to put between this device and your place as well to keep things snug. Finally, as a nice little touch, the charger they include is very small and has a red cord so its easier to find in a mess of cables. One of my favorite features (and the reason Im ultimately going to keep this over the CEntrance HiFi M8 in my portable rig) is that it will charge your iDevice while you have the Theorem powered on. This may seem like a small thing, but its a huge bonus to me because it means I no longer have to carry around an extra cable or charger for my iPod, nor do I need to worry about having to charge that device separately. I have my iPod permanently strapped to the top of the Theorem, and charging the one device takes care of both of them. Battery life seems to be excellent, Ive yet to fully drain the battery but just put a cumulative 16 hours of flight time on it between charges, so I know it lasts at least that long. 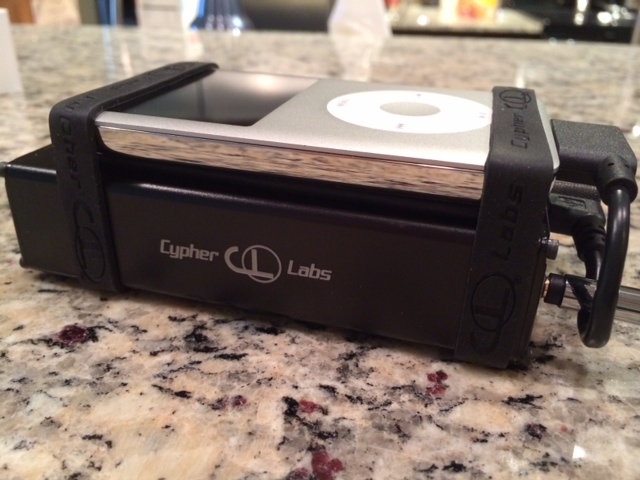 Cyber Labs claims 18 hours of battery life when plugging in a fully charged iPod, and keep in mind that 18 hours INCLUDES drain for charging the iPod, so worst case if this thing died on my at 18 hours I could switch over and still use the iPod to listen because it would have a full battery. On an Android device this is rated up to 24 hours, as it has no charging capability for Android device due to the lack of a standard in how those devices are all charged. Although Ive not cracked it open, Ive read that the battery is removable and can be replaced. Ironically, this is where I have the least amount to say. Its hard to say much other than this thing sound FANTASTIC! The DAC section is very good and headphone amp is simply superb. Honestly, compared to my desktop rig its 99% as good, lacking only that very last bit of resolution in the DAC section, and in some ways I even prefer the slightly fuller sound that this device has over my desktop rig. The DAC section is not quite on par with the Oppo 105, but its closer than it should be. What really surprised me is how well it fared against my desktop rig, its shocking how good this thing sounds and right now I have no regrets with parting with my desktop gear in the effort there to build a higher end rig, this will serve me quite well until I get that sorted out. I find the sound on this and the CEntrance both quite good, the CEntrance sounds slightly more dry and fast, with the Theorem opting for a little more warmth. Its important to note that these differences are very small, and if I were blindfolded and asked to listen to random passages of music on each Id have a hard time telling them apart if the volumes were set to the same level on each device. Its good enough that it could serve as the DAC in a very good speaker system, it sounds great as even a desktop headphone rig, and its absurd how good this thing sounds as a portable setup  what more is there to say? I am not into IEMs so I have not tested this device with any, but word on the street is that with really sensitive IEMs the noise floor can be a bit too loud for some people. I've tested it on on several efficient headphones like the Amperior, Momentum P7, etc and it is dead silent on all of those. 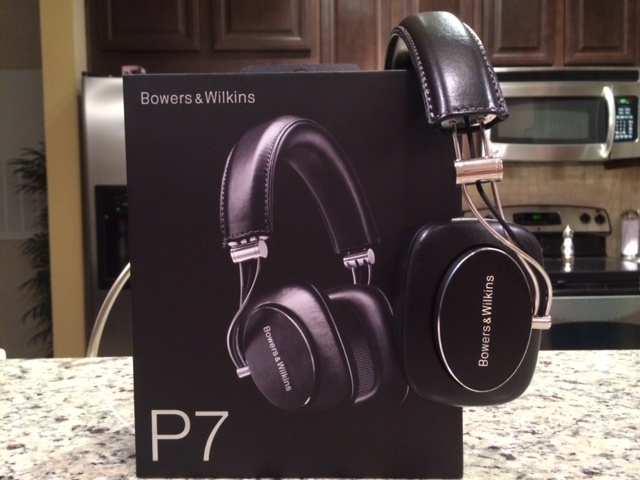 As mentioned earlier, the closest competitor is the CEntrance HiFi M8. V-Moda has a Vamp that has similar functionality, but is not in the same league as the Theorem in terms of power. Fostex has one as well, but it's not quite as powerful and does not also function as a USB DAC, it's iDevice only, plus the volume knob sticks way out and is annoying. Sony has one that I found too bright for my taste, sounded harsh at times. ADL has one, but I've not had a chance to hear it, although on paper does not look quite as powerful as the Theorem. Them there are the DAC/Amp stacks that people use, where the two are separate. There are lots of those on the market, but those are too bulky for my needs and I've not tested any of them. Cypher Labs even has their own stack that they sell which is supposed to sound great as well, just not ideal for my needs. The CEntrance HiFi M8 sounds just as good and is as powerful, maybe slightly more so, than the Theorem. The great thing about the M8 is the flexibility. It starts with the ordering process, where you pick your blend of inputs and outputs - the combinations of these provide 8 models from which you can choose. I ordered the M8 XL4, which has USB and iDevice DAC support and balanced and unbalanced headphone output, spdif output and fixed line level outputs. The M8 also has treble and bass tone shaping controls and several gain settings as well. From creation to operation, the HiFi M8 has more flexibility than the Theorem. Since they both sound so good, the decision between the two came down to size and features - the Theorem was a good bit smaller than the M8 and the charging of the iPod from the Theorem really makes my life that much easier. At $899 MSRP the Theorem isn't what I'd call cheap, in fact right now its the most expensive option on the market. Given the performance, size and features though I think that's a very fair asking price. That said, TTVJ has these for $799 and that's probably more in line with where the price should be given the competition. 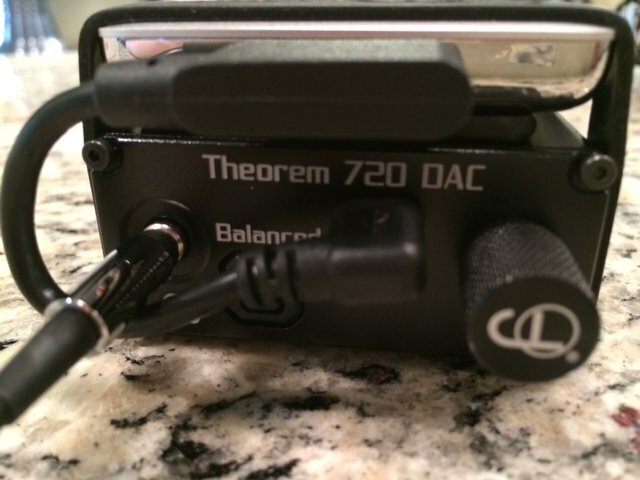 So if you're looking to build a killer portable rig, I'd highly recommend the Theorem 720, it's a superb sounding unit with great features and battery life. You really can't go wrong with the HiFi M8 either, and if you prefer the flexibility of that model over the size and charging ability of the Theorem its a great option as well. The M8 is also cheaper than the Theorem as well, so that's something to consider. I've had this a few months now and thought I'd provide a quick update. This thing is a fantastic portable device and really good enough to be used in even a desktop rig. My headphone world has changed quite a bit the last few weeks and will continue to change in the coming months as I try to assemble my 'cost no object' headphone rig. The one constant has been (and will continue to be) this DAC / Amp. For a while I was carrying this thing to work with my iPod Classic strapped to the top, powering my B&W P7 headphones. I've since taken a job that requires me to interact with people a good bit more and so have replaced this setup with a simple iPod Classic and a pair of the Bose IEMs. I've posted about that in another thread, the Bose obviously don't have audiophile sound but they sound decent and are the most comfortable IEMs I've ever worn, by a mile. So that has the Theorem in a weird place - I don't really need it as a portable device any more and I have better gear for my desktop setup at home...or do I? 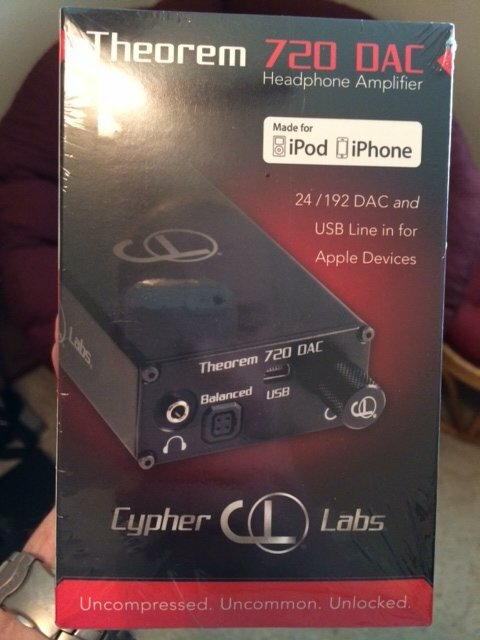 1 - I've switched to now using the Theorem as my primary DAC and amp for my primary rig. This is nice because I can connect it directly to computer to use the USB DAC functionality and be able to play my full library including high resolution music. Or I can plug directly into the iPod and then have a portable rig I can carry around the house and I'm not tied to my desk, I use this setup the most often unless I want to listen to hi-rez files, which sadly the iPod does not support. 2 - This also means that I need a better desktop rig, because I know this little device is not my end game for sound quality. This has started me down the path of building a 'cost no object' desktop rig. Unfortunately I'm not infinitely wealthy and there are some options coming that have not yet hit the market, so this is going to be a long process. I'll have this and the rest of my headphone gear with me at LSAF this weekend, hopefully you locals will have a few minutes to listen.